In this book you will find the stories the author came up with for her daughter (now 6 years old), and you will also find small templates to invent your own. Reading Little Red Riding Hood is fine at a certain age, because it’s a classic. But times have changed and it makes sense that the stories we make up now include traffic lights, televisions, urban gardens, cereals, etc. For all the parents who are tired of Little Red Riding Hood and The Three Little Pigs and want to tell their children original, different stories. The perfect gift book, for new mothers, birthdays, Christmas, etc. 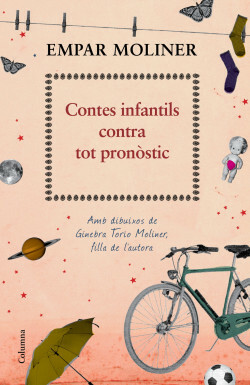 The best of the stories Empar Moliner made up for her daughter, collected in a practical and fun book for the whole family.